A pair of Drexel engineers is developing a new sensor that can detect one of the most challenging hospital-acquired infections easily, early and without expensive equipment. Wan and Wei-Heng Shih, professors in the School of Biomedical Engineering, Science and Health Systems and College of Engineering, respectively, are using their expertise in piezoelectric sensor technology to detect the presence of a pernicious bacterium. 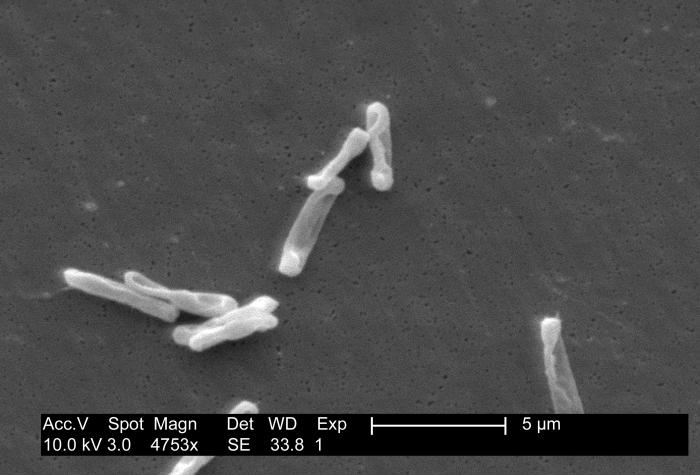 Clostridium difficile bacteria cause infections that kill more than 14,000 Americans each year. Their target, Clostridium difficile, is a bacterium that causes infections in the colon, severe diarrhea and is responsible for 14,000 deaths in America each year. Tracking down the spore-forming bacterium is a real challenge because it lives in the human gut with thousands of other bacteria that are just going about their business without causing harm. What’s worse is that C. difficile tends to afflict the elderly and others in healthcare facilities that have been treated with antibiotics for other infections and have weakened immune systems. This means that the standard barrage of antibiotics, that eradicate a wide range of gut bacteria, are not a feasible treatment option –in fact, they can actually make a patient more susceptible to C. difficile infections. If patients with diarrhea are simply treated with the antibiotic regimen without confirming that C. difficile is the cause, the bacteria can build up a tolerance to the antibiotic –making it more difficult to treat in the future. Conversely, if patients with C. difficile are not given the aggressive treatment regimen it may lead to serious infection or even death and rampant spreading of the disease within the healthcare facilities. So, confirming or ruling out C. difficile is important to get the patients the right treatment, right away. The Shihs are trying to give doctors a tool that will help them make a quick and accurate diagnosis. To do it they’re using a tiny ceramic plate about a millimeter long, half a millimeter wide and thinner than a strand of hair that might sound familiar to a watchmaker. 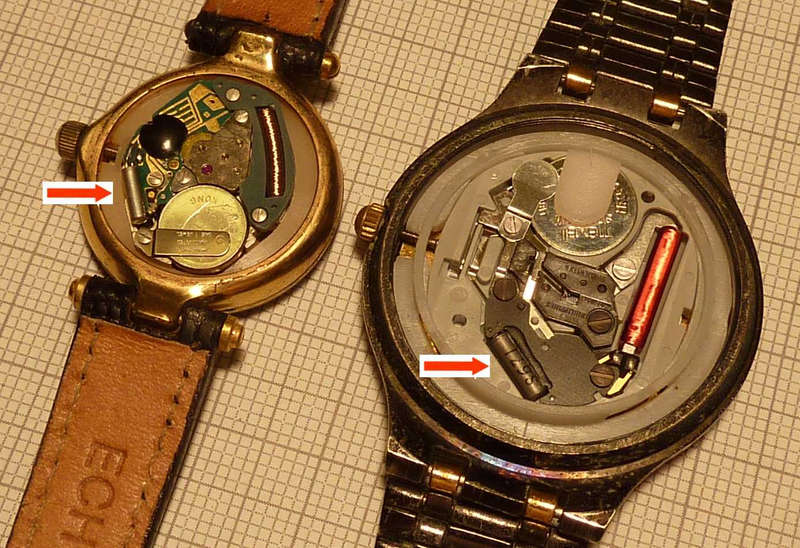 The quartz resonators pictured here keep watches running on time. Similar technology, in the Shihs’ piezoelectric sensor, could be used to detect bacterial DNA. The plate functions a lot like the piezoelectric tuning forks used to keep quartz watches ticking on time. An electrical current causes it to oscillate back and forth at a regular pace –or frequency. This movement also is similar to that of an acoustic resonating tuning fork, whose strike-induced oscillation and resultant sound is used to tune instruments and keep singers on pitch. Drawing on their backgrounds in biomedical engineering and materials science, the Shihs have perfected a ceramic-making process that allows the plate to be very thin while retaining a specific crystalline structure that facilitates electrically driven oscillation. The slightest change to the orientation of this crystalline structure results in a change in the pitch of the oscillation –not unlike the way the pitch of a tuning fork would change if you shortened or lengthened its prongs. This characteristic is significant because the surface of the crystals can be functionalized to catch certain DNA molecules –like the ones C. difficile uses to code its toxins – so when the plate snags a few molecules of C. difficile DNA from a stool sample, its oscillatory tune changes, letting technicians know that they are dealing with a bona fide case of the infection. Tiny piezoelectric sensors, like this one, invented at Drexel, could one day help prevent the spread of Clostridium difficile infections. Changing the length of the prongs of a tuning fork would change its pitch, a similar principle is exploited in the Shihs’ piezoelectric sensor. According to Wan Shih, the plate is sensitive enough to directly detect the presence of C. difficile in stool from only a few molecules of its DNA. This gives the plate sensor an advantage over the C. difficile tests on the market right now, because they all involve a complicated process of isolating and amplifying DNA from a sample before confirming the infection. These tests also require expensive equipment that isn’t available at many hospitals. The Shihs’ goal in making the piezoelectric plate sensor is to give doctors an inexpensive test that can be performed quickly in the field or a clinic and reused multiple times to detect the infection with a high degree of accuracy–so as to initiate the right antibiotic treatment for better patient outcome. With additional research funding, the Shihs plan to make the first prototype of the sensor so they can move forward with clinical trials. But they’re also envisioning a broader scope for its use in detecting infectious diseases –and have created their own start-up company, Lenima Field Diagnostics, LLC, to support that vision. “If we can one day tailor the sensor to detect other diseases, it can be used for point-of-care applications for diseases that need to be treated immediately or could be fatal,” Shih said.